SLC6A4 is a gene located on the 17th chromosome in humans, specifically at 17q11.1–q12. Synaptic transmission, also known as neurotransmission, is the process through which all biochemical communication- motor, sensory and cognitive- is processed. SLC6A4 produces a protein that is integral in the synaptic transmission of serotonin. Serotonin is a monoamine neurotransmitter found throughout the body as well as in the brain. It causes the contraction of smooth muscle tissue, and as a result, is involved in systems such as arousal, thermo regulation, mood, appetite, sleep and pain regulatory functions ("What is Serotonin and What Does it Do?") . The expression of SLC6A4 can therefore affect some of these biological processes. 1) As depicted above by the parallel lightning bolts, an electrical impulse called an "action potential" initiates communication between pre and post synaptic neurons. 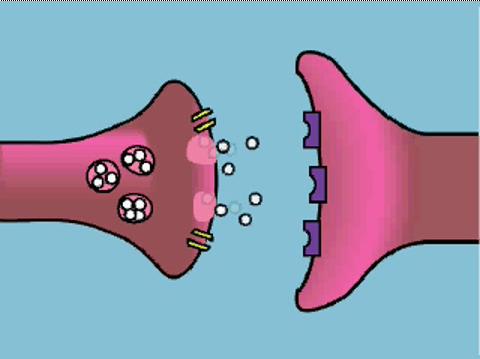 2) The action potential continues to signal the release of serotonin neurotransmitter, as depicted by the small white balls below. 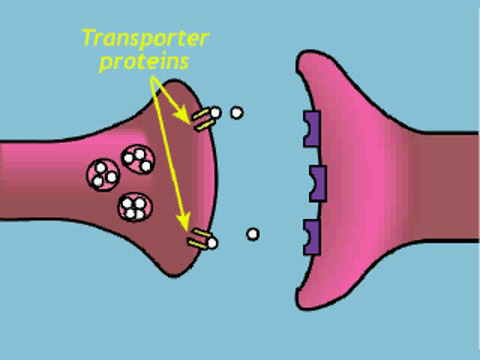 The vesicles enclosing the serotonin neurotransmitters bind to the membrane of the presynaptic neuron and open to release serotonin transmitter into the synaptic space between neurons. 4) Once serotonin neurotransmitters have relayed their message to the post synaptic neuron, they re-enter the synaptic space, where some are degraded. This is the point at which SLC6A4's product comes into play. SLC6a4 encodes for the serotonin neurotransmitter transporter protein. This protein is responsible for the recycling of the remaining serotonin neurotransmitters back into the presynaptic neuron. The serotonin neurotransmitters are then repackaged into vesicles to be used again. 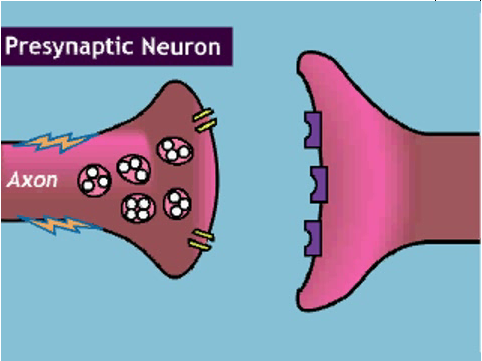 3) Serotonin neurotransmitters then travel across the synaptic space to the post synaptic neuron and relay their signal. 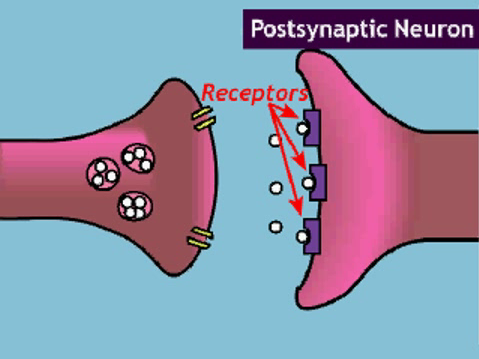 They bind to the receptors of the post synaptic neuron, triggering another action potential in the post synaptic neuron. There are two main variants of the SLC6A4 in the promoter region approximately 1kb upstream of the SLC6A4 gene. The first is the S allele, or the "short" allele, and it is marked by a deletion which significantly decreases the transcription of SLC6A4. It therefore also decreases the production of serotonin transmitter transporter proteins, which contributes to a decreased re-uptake of serotonin to the pre-synaptic neuron. The second allele is marked by a tandem repeat in the second intron of SLC6A4. Conversely, this repeat significantly increases SLC6A4's transcriptional activity. This contributes to an increased production of serotonin transmitter transporters, and thus contributes to excessive re-uptake of serotonin. From this, we can infer that serotonin would then not be completely successfully transmitted to the post-synaptic neuron, as serotonin might be recycled before it is able to be fully transmitted. Both S and L variants are thought to be linked to behavioral conditions such as depression, obsessive compulsive disorder, alcoholism, and bipolar disorder. SLC6A4 serotonin neurotransmitter transporter proteins are the target of some anti depressants. Although little is known of the evolution of SLC6A4, the same gene variants have been found in humans as well as in rhesus macaques, a species of primates found in China and India. Curiously enough, the S and L variants evolved in both species independently, a parallel evolution that suggests evolutionary advantages of these variants. And finally, these were our results when we performed the gel electrophoresis. Our samples were in slots 4 and 6. Using these two primers, we expected our PCR product size to be 425 base pairs long. Not much seems to be visible from slot 4, but in slot 6, a faint line can be seen parallel to the most distinct line in slot 5. Upon checking against the 100 bp ladder, that seems to be very close to the 400 bp line, meaning that we were likely able to accomplish cutting a 425 bp as expected. Carlson, MacAlester. "What is Serotonin and What Does It Do?" How much control do we really have over our anxiety? Last modified 2001. Accessed May 10, 2014. http://www.macalester.edu/academics/psychology/whathap/ubnrp/placebo/serotonin2.html. The Human Gene Compendium. "Solute Carrier Family 6 (Neurotransmitter Transporter)." Gene Cards. Last modified November 3, 2013. Accessed May 10, 2014. http://www.genecards.org/cgi-bin/carddisp.pl?gene=SLC6A4. National Institutes. "How Neurotransmission Works." The Brain: Understanding Neurobiology of Health; National Institute of Drug Abuse. Accessed May 11, 2014. http://science.education.nih.gov/supplements/nih2/addiction/activities/lesson2_neurotransmission.htm. Shah, Maulik P., Fei Wang, and Jessica H. Kalmar. "Role of Variation in the Serotonin Transporter Protein Gene ( SLC6A4 ) in Trait Disturbances in the Ventral Anterior Cingulate in Bipolar Disorder." Neuropsychopharmacology, 2009, 1301-10. Shattuck, M. R., J. Satkoski-Trask, and A. Deinard. "The evolutionary history of SLC6A4 and the role of plasticity in Macaca." American Journal of Physical Anthropology, 1-12. Stufflebeam, Robert. "Neurons, Synapses, Action Potentials, and Neurotransmission." Consortium on Cognitive Science Instruction. Accessed May 7, 2014. http://www.mind.ilstu.edu/curriculum/neurons_intro/neurons_intro.php. Wendland, J. R., B. J. Martin, and M. R. Cruse. "Simultaneous genotyping of four functional loci of human SLC6A4 , with a reappraisal of 5-HTTLPR and rs25531." Molecular Psychiatry, 2006, 224-26. http://www.nature.com/mp/journal/v11/n3/full/4001789a.html. "Yin And Yang Of Genes For Mood Disorders." Science Daily. Last modified March 17, 2008. Accessed May 10, 2014. http://www.sciencedaily.com/releases/2008/03/080312172620.htm.